Gordon’s of Alford is no more. From a washer to a high fashion, from flower seeds to carpets, from a teaspoon to a wardrobe the place to go was Gordon’s of Alford. This was a business that was innovative and ambitious. The intrepid Gordons took the road – rural roads, unrecognisable as roads to most, their familiar maroon vans stuffed to the gunnels with goods destined for Durness at the top of the mainland and across the sea to Skye. Their fleet of transport was impressive. It was Gordon’s who started up the first self-service (pre-supermarket) shop in this area. James Gordon opened his first store in Alford in Aberdeenshire in 1923 and from modest beginnings the business expanded, proving highly successful and attracting not only locals but enticing people out from the city of Aberdeen and everywhere round and about – for it sold nearly everything at one time. Many’s a time we’ve been in Aberdeen and come away having failed to get whatever in the likes of B&Q, got back home, nipped into Gordon’s and found it there. This is one store that is going to be missed. It was back in the 1930s that Gordon’s first drapery van took the shop out to farms in outlying areas in this agricultural part of the world. Twice a year Gordon’s made the run over the west and north, in April and October – providing the west’s first fashion show with professional models from Aberdeen. Women, not only in the Vale but right across the west came to rely on Gordon’s for their annual replacement corsets. During World War II a couple of members of the Gordon staff were in Aberdeen picking up goods when the air raid sirens sounded. The city emptied; people heading off to shelter and abandoning Union Street – except for a solitary Gordon’s of Alford van with two stalwarts on board determinedly driving along a deserted Union Street as fast as their wheels could turn. And make it home they did – in a clash between the Luftwaffe and Gordon’s of Alford – the men of Aberdeenshire triumphed. The Under-Secretary for Foreign Affairs made a statement in the House of Commons on Wednesday April 22nd 1914 about the brutal murder of Keig man at the hands of Pancho Villa. A telegram from a citizen of El Paso was read out in the US Senate stating that Benton was murdered like a dog. This was slap-bang in the middle of the Mexican Revolution and Pancho Villa (General Villa of the revolutionary army) was in charge of Mexico’s northern area of Chihuahua. William Smith Benton had lived in Mexico for over twenty years and grown immensely wealthy on his cattle ranch of over 100,000. It is said that revolutionaries had relieved him of his ranch and it was from Texas that he travelled south to demand he be allowed to move 400 head of his cattle from his estate north into the US. Benton was either a highly respected and honoured citizen of the region, according to the New York Times, or a man who disrespected and abused native Mexicans, according to supporters of the Revolution. Both he and Villa were hot-tempered and when Villa refused Benton’s request or demand on grounds that Mexico had need of the beef and that Benton was a cattle thief and murderer Benton accused him of being a bandit and desperado. One version of events reports that Villa launched at Benton with a dagger and would have killed him on the spot but for the intervention of the Mexican’s wife, Maria Luz Corral. On his way to Villa’s home Benton had met up with an American railroad engineer called Gustav Bauch. Both men waited to see Villa at his home. Benton was said to be armed with a pistol. William S. Benton was the son of James Benton of Airlie at Keig in Aberdeenshire, born in 1860. Several Bentons lived in the northeast, having moved to Scotland from Long Benton , near Newcastle Yorkshire in England at the invitation of a laird of Newe during the early 18th century. As farmers they cultivated land in west Aberdeenshire, including Meikle Endovie and Tonley, “the holdings of the English immigrants.” Bentons moved to Keig – Old Balgowan and Airlie at Keig, above Alford, to Crookmore at Tullynessle and others to Banffshire to Sheriffhaugh. A cousin of William S. Benton, James Thomson Benton, was murdered in Texas in 1875 – I haven’t checked out the circumstances of that killing and it must be said the Benton’s are not easy to trace for they suffer from a sever dearth of variety of names – if it’s not William then it’s James. Texas, however, was a lawless place and disputes were often ended by pistols. The year James Thomson Benton was murdered the young William, a lad of fifteen, finished his elementary education at Aberdeen Grammar School and in England and enrolled at Aberdeen University. By 1877 he had left university and emigrated to Texas, to join his cousin’s family. Stateside there were banking Bentons, transport Bentons and silver mining interests Bentons. And, of course, ranching Bentons. The events of the 17th February 1914 are much disputed and those witnesses that were around were said to have been moved away to other parts of Mexico on orders from Villa. Villa accused Benton of reaching for his six-shooter during their loud altercation in an attempt to assassinate him at which point Villa’s guards arrested Benton. It was claimed Benton was summarily tried and admitted his guilt and knowing he was to be executed requested his ranch was given over to his widow, a Mexican, and that his grave was dug deep to prevent coyotes from feeding on his body. Whatever went on in the room, Gustav Bauch waiting in the hall outside noticed everything went suddenly quiet and when Benton failed to reappear he asked about his whereabouts, at which point Bauch was arrested by Villa’s merciless right-hand man, Fierro. Rumours abounded that Benton had been taken out and clubbed to death by Fierro then set on fire to destroy evidence of the crime. Meanwhile Bauch, an American, was ‘fitted-up’ with accusations he was a spy for the anti-revolutionaries and jailed. Quickly the men’s disappearance was raised with Benton’s widow, although she was unaware she was a widow then, who asked the American government to look into her husband’s disappearance. The Americans went along with Villas version of events that Benton was tried and found guilty and at the time of their enquiries he still lived, in jail despite Benton’s widow’s belief he had been killed. Then Pancho Villas declared Benton had been executed and thinking he could cover up what was clearly violent murder ordered a posthumous case against Benton be prepared to satisfy the man’s widow, and the Americans on her behalf. Forging documents is one thing but forging a signature when you don’t know what it looks like is something else. The search was on for a document bearing Benton’s signature and his original complaint about the movement of his cattle was tracked down bearing a signature which could be copied. There was still the small issue of Bauch being a witness to the sudden disappearance of Benton – and given that Benton’s body had been disposed of things were becoming complicated. It was decided therefore to execute Bauch – in Benton’s place so to speak -and once his body decayed it would be presented as Benton’s. and went on to demonise Villa in an all-too-familiar racist tone accusing him of being high on drink and drugs. The contrary view among many Mexicans was that Villa was a national hero and Benton the villain. Villa was also destined to die violently by firing squad a few years later. For a time in Britain there was continued hope Benton was alive and in custody with the government content to channel enquiries through the Americans. As the mystery deepened Villa told the Americans Benton had been executed but the American State Department did not inform the press of this and somehow became implicated in covering up the Benton affair. The British government was reluctant to make much of the matter but for a time newspapers pushed for answers which didn’t come. 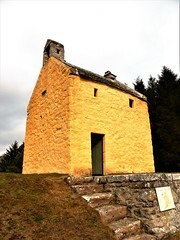 This austere looking church sits on a spot that has been occupied by churches for centuries on the lower slopes of the Suie close to the Suie and Esset burns. Constructed from local grey granite from Sylavethy quarry in 1876 the church’s dour solidity is broken by elegant lancet windows. The North end was once taller when it featured a 1604 birdcage bellcote that was rescued from an earlier, presumably sandstone kirk, for the bellcote is made from sandstone which is much softer and more pliable than igneous granite. The bellcote now occupies a spot just inside the kirkyard gate. The graveyard doesn’t have very many gravestones though a number of early flat stones lie hidden beneath the turf which is a shame because the few visible points hint at the iconographical treasures of mortality and immortality symbols that lie there forgotten. What stands upright reads like a history, if short, of the area featuring several families long associated with the Howe o’ Alford such as Coutts, Comfort, Mathers, McCombie, Spence. Tullynessle is an area that lies west of Alford in Aberdeenshire and takes in a large expanse of some great farming country. The old church is situated on the lower slopes of the Suie by the Suie burn and near the burn of Esset which might just have given rise to its name, or not. Tully or sometimes Tilly is well-known around Scotland from the Gaelic tullich for wee hill or knoll. However it got its name it has one. This was Forbes country – Forbes with the ‘e’ pronounced as you would German words, sounding all the letters. ForbES is still much heard in the Howe o’ Alford to this day along with the Anglicised Forbs. Where the land wasn’t claimed by a Forbes it was said to belong to the Gordons. There are lots of Gordons around this area. The estate of Terpersie at Tullynessle was one of theirs and briefly lost when taken off the Gordons for supporting the Jacobite cause during the rebellion. Gordon of Terpersie was one of many hunted down by the British state soon after the Union to demonstrate it would deal severely with anyone who defied it. Terpersie was sold to the York Company, as were other Scottish estates but Terpersie was later bought from the English company by a different Gordon – the original having been executed in London. The history of the area is much more ancient than the 18th century. There’s a mention on one of the gravestones to the deceased having lived at Druidsfield. This is a reference to the very many ancient stone circles, most containing impressive recumbent stones, scattered throughout Aberdeenshire. We tend not to speak of them as Druid stones any longer but that’s what they used to be called – and believed to be outdoor temples used by Druids for their ceremonies. Most of them were destroyed over centuries when stones were cleared to make land fit for growing crops. Lots were blown up to help their removal because they were so massive which always makes those of us who visit our stone circles wonder at the ability of Neolithic people to drag them to their hilltop sites and place them so accurately they’ve stood in place for millennia. If you’ve never seen them some are mind-blowingly large. Scots, like the migrants of today, were inveterate travellers and seekers of a better life such as the sons of David Grant and his wife Margaret Barron who farmed at Millcroft. Robert and David settled in Australia and New Zealand. One of the grander memorials belongs to the Spence family. Alexander Spence died in 1913 aged 84 years. His wife’s sudden death preceded his about a month, Annie Tawse Morrison was her name. Their two daughters Eliza and Jessie died as young children and were interred in Glenbuchat churchyard while another daughter, Jeannie, died in the same year as her parents, in 1913, aged 48 years. Spence was born in 1829 in Towie at Glenkindie and began work as a farm labourer. He rose to ploughman then he went to take over from his father-in-law who ran the Pooldhullie Toll Car, carriers in Strathdon. It was not until he was an elderly man that Alexander Spence took out a lease on the Forbes Arms Hotel at the Brig. According to his obituary Alexander Spence had a reputation as being highly talented working with animals, almost equal to a qualified veterinary surgeon it was claimed and he retained an interest in horses throughout his life. He made the Forbes Arms hotel into a popular venue for anglers and tourists, not so difficult perhaps given its prize location above the River Don and Spence ensuring he had fishing rights on various parts of the river to offer to his guests. A fine, well-cared for war memorial stands in a corner of the graveyard: a light grey-white granite rectangular block topped with a simple cross it commemorates service men and women from the area killed during the Great War and the Second World War. Their occupations remind us how it was that ordinary young men and women were torn away from everything familiar and transported away never to return home to the familiar quiet beauty of Tullynessle, presumably often in their thoughts: Alex Comfort; Hardware clerk; James Craig: van man; James McGregor: carpenter; William Campbell: mason; John Reid: North of Scotland Bank; I. Spence: nursing sister. I assume I. Spence belonged to the same Spences who moved here from Glenkindie for the address is close to the Forbes Arms. Nursing Sister Isobel Spence QAIMNS, only daughter of Mr and Mrs John Spence, Waterside of Forbes, Alford, was reported missing at sea shortly before her presumed death was announced. 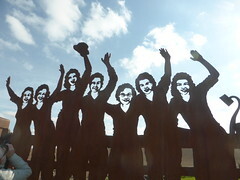 Isobel did her nurse training at Foresterhill in Aberdeen only completing it in March 1942. Two years later, at the age of 23 years she was killed in action, in March 1944. A great number of nurses were lost at sea, some sailing to other parts of the world as part of their war service and others in the hospital ships they lived and worked on. I don’t know where Isobel was drowned as newspaper accounts gave away little information during the war. Tullynessle Kirk’s alternative name is St Neachtan which is a name I’ve never come across before so had to look it up. It appears this was Neachtan, Nechtan, Nathalan or variations of them who arrived as a missionary from Ireland in the early 9th century as many others were also doing, and his name was adopted in different parts of Scotland. James Smith was employed as minister at Tullynessle for thirty-six years and was also a schoolmaster in the parish. 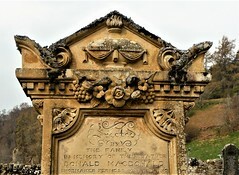 He died in 1861 aged 63 years and the stone mentions his young daughters who died as children: Elizabeth aged 14 months; Mary Paull aged 10 years as well as Jane Elizabeth aged 19 years. His son died at 17 years old and James was outlived by his wife Jane Robertson (Scottish women retain their single names) who lived into her 70th year. A fine marble tablet commemorates the life and work of the Reverend Andrew Marshall who served the 18th century church for 25 years and who died in 1812. He was buried with his ten dead children who never survived into adulthood. His widow, Mary Grant, is also mentioned. She died at Aberdeen but was buried alongside her husband and their children. The novel Sunset Song is a powerful, sensitive book, intelligent, evocative of rural life in north east Scotland before the First World War. It ends shockingly and brutally with a hint of the breakdown of a way of life and passage into a different one as the trilogy continues in the succeeding two volumes of A Scots’ Quair. I was full of guarded anticipation before seeing the film, and trepidation. A native of north east Scotland, though not Aberdeenshire and Kincardineshire, I’ve seen my fair share of botched productions ostensibly set here but which make no effort to replicate the tongue nor sense of place. From audiences in Aberdeen there were the inevitable complaints of they didn’t capture the accent. I agree but surely a small point? But they’re actors, it was said. Yes, indeed they are. For many women in this part of the world we are Chris Guthrie. She is one of literature’s great heroines. Her family are small tenant farmers – not crofters as a reviewer in the Financial Times claimed. She was bright and ready to go on to train as a teacher before tragedy struck her family and as the daughter of the household was expected to give up her independence for domesticity. She is, therefore, trapped and the film director conveyed this through a series of interior scenes dark and shadowy with shafts of sunlight through a window or glint of fire or candlelight. But Chris was never wholly trapped for she lived through her imagination that was given free rein outdoors in the majestic and dramatic landscape of the Mearns – among the mysterious stone circles. Sadly there was no sense of this in the film which turned her world into a series of Dutch interiors with the delicate heroine flitting between rooms. 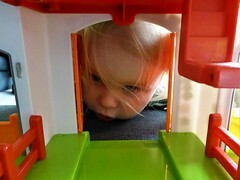 When Chris took over the farm the Director had her look back into the house as if stone walls signified her freedom. The real Chris Guthrie escaped onto the hills and into the fields to lie on land her father worked as had generations of men and women before him. People who hauled great boulders from the red, rich soil, who uprooted whin and broom and chopped down trees and wrocht the grun till oats and barley flourished. She knew when she lay down on heather or corn stubble scratching at her back with the peesies flying overhead that this was not a desert but land shaped by generations of farmers who were not only farmers for some were Jacobins who’d gather in Aberdeen to riot for liberty, equality and fraternity; Covenanters; Jacobites who fought with Charlie; men who attacked the English garrison at Dunnottar with Wallace; Picts that mapped the land and skies, who quarried and worked and arranged their circles of stones in ways magical and mysterious. This was Chris Guthrie’s inheritance and the very essence of the Chris was no pre-Raphaelite flimsy cut-out but a woman rooted in tradition whose back was strong from hard-work, not the pretty young thing who had daintily stepped out of the pages of Vanity Fair onto alien soil. Peter Mullan was a good brutish John Guthrie but he might have been John Guthrie a granite mason in Aberdeen (apart from the accent) for there wasn’t any sense he was part of that community of fellow tenant farmers, bothy billies, ploughmen and orra men – the majority of whom had lives constrained and ambitions dashed by poverty and exigency. We did see past the mere coarse brute to the former man and lover of the dead wife as he took her hand and kissed her and it was not a stretch to see the same strains that were later placed upon Ewan Tavendale when forced by social pressures to uproot himself from the life he knew and loved to fight in a war that meant nothing to him. In this episode he is transformed from the thoughtful young husband into a defeated victim who turns his anger and frustration onto his wife and child, and as with John Guthrie we see beyond the defensive shell both men built around themselves. There was no sense of the northeast in the film; the land so beautiful, the skies so vast, the sea so shimmering, the cries and flutterings of the peesies. The folk of the northeast are couthy and friendly and acerbically humorous as they cut each and everyone down to size. Those powerful characters of Chae Strachan, a socialist and good friend of Chris’s, and Long Rob of the Mill who worshipped no particular religious or political god but had a good sense of himself – they were mere walk-on parts in the film. The ideals and radicalism woven into the book got scarce mention and without that so much of the novel’s impact is lost. The setting for Sunset Song was quite particular. Life is not the same for people throughout Scotland never mind the United Kingdom. Sure we all have things in common but there are nuances of differences which are interesting and do matter. The Director is surely oblivious to this. One scene set in a wee Presbyterian kirk looks good but the music, bad throughout the film (not just bad but really, really awful) was more high English church with its soaring choirs singing of ‘lembs’ and has absolutely nothing to do with the Scottish kirk and turned the scene into a farce. (The old kirks had no organs and the congregation followed a precentor in unaccompanied psalm singing – the result was a wonderful ebb and flow of sound.) And why were the good farming folk of the Mearns walking through the barley to get to the kirk? Did they not have roads or tracks? Think they did. Just silly. Films rarely live up to a good book and this one certainly doesn’t. Some will enjoy it for what it is – a pithy drama – but it isn’t Sunset Song by Lewis Grassic Gibbon, more Stella Gibbon’s Cold Comfort Farm. PPS I have read that Terence Davies regards this minor classic as ‘very badly written’. The arrogance of the man to take a fine piece of literature which as I say above he does not understand and destroy it in the eyes of many by making an inferior film and then criticise the book for being poor beggars belief. He said in the same interview he never watched the original film version – it shows Terence Davies. You should have and then you might have learnt a thing or two – but for a man with an ego as huge as his he would probably have rejected this much superior version as much as Gibbon’s original work. Please Terence Davies do not attempt to film the remaining books in the trilogy – leave that for someone who knows what they are about. One day a year or two back a local farmer stopped me with a wave of his hand and a smile. ‘You’re the woman that takes photographs,’ he said. I could hardly deny it as my camera was dangling from my fingers. I squinted at him and shook my head then remembered having noticed white multi-headed thistles which I now know are Cirsium arvense. ‘No,’ came his dismissive reply, ‘the proper thistles, the big anes, I have them growing over there,’ and he pointed to the track leading to his house. As it happened it was late in the season and there were none for me to see but I vowed to check them out the following year and capture the unusual blooms with my camera. In the meantime I urged my friendly farmer to get in touch with someone, anyone – perhaps at the university – who might know about white thistles. The farmer was Leslie Angus and he was keen to share his most unusual thistles with the world but he was a busy man with better things to do with his time. As luck would have it the following summer none of the white thistles flowered so I had to content myself photographing the common but pretty purple ones. The year after that I was chatting to Mr Angus and mentioned that they hadn’t flowered again but he put me right – they had but in a different site and as I hadn’t been out so often during the poor summer our paths hadn’t crossed and I had missed another opportunity to see them. This summer things were very different. The weather was lovely and the conditions for walking were benign. He led me into one of his parks and we made our way past a herd of curious cattle to the place where the white thistles grow. They were magnificent. He hadn’t imagined them nor had he been pulling my leg. There they were; bold, striking and very, very white. I took a few pictures and went home to investigate incidences of white thistles but then I happened to glance at a restaurant review in a local newspaper and was astonished at one of life’s coincidences; a photograph of a table arrangement included a single white thistle. On closer inspection it didn’t look quite right. I phoned the restaurant and its bemused owner informed me his thistles were indeed artificial. Artificial white thistles seem to be quite popular; they are used as buttonholes for weddings as any glance at Google images will confirm. It so happens that Carole, Mr Angus’ daughter, has her own florist business and this summer one lucky groom actually sported a genuine white thistle in his buttonhole at his wedding. 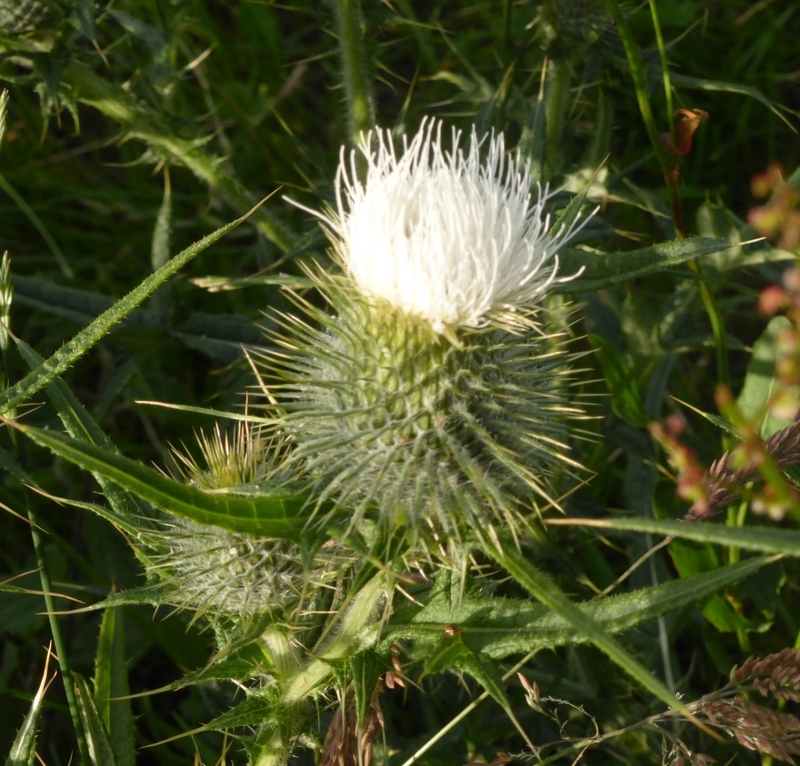 White thistles do exist. The aforementioned Cirsium arvense frequently display white blooms and worldwide different varieties of thistle include several whites but they are rare among Cirsium vulgare, the spear thistle – the one we see at roadsides and around edges of fields. Thistles in the wrong place can be the bane of farmers’ lives. They are tenacious once they get into the soil and a pest to weed out. Not that Mr Angus minds. He appreciates their exquisite rarity. While the purples are grand the spectacle of one or two whites among them makes them even more special. The thistle has been Scotland’s flower emblem for nearly 1000 years from the reign of Alexander III when its jabbiness was supposed to have caused barefoot Norse invaders so much pain when they trod on them they cried out and alerted the Scottish guard. 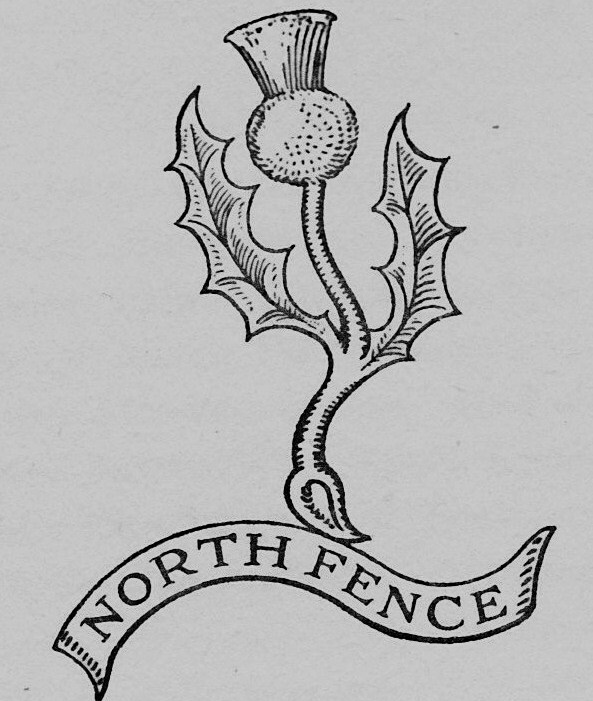 The thistle became the symbol of the House of Stuart, the oldest Scottish chivalric medal is the Order of the Thistle and where would Scottish regiments be without a thistle to decorate their bonnets? The plant has given its name to sports clubs and is the motif for a host of organisations and businesses including the Encyclopaedia Britannica, the Carnegie Mellon University and the Perelman School of Medicine, Pennsylvania in recognition of their Scottish roots. Scotland’s national flower is the thistle but which one is a moot point. 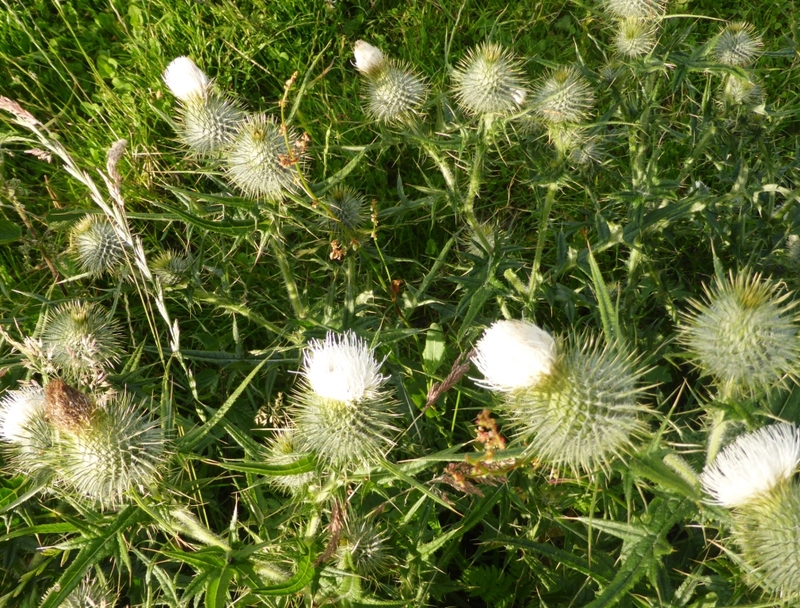 Some say it is the aforementioned Cirsium vulgare while others declare it Onopordum acanthium, the woolly or cotton thistle, but there are doubts over how long that species has grown in Scotland. The same caution applies to Carduus lanceolatus and what of the dwarf thistle Cirsium acaule or the musk thistle Carduus nutans? How about the melancholy thistle Cirsium heterophyllum or Carduus benedictus, Lady’s Thistle? Carlina vulgaris is a member of the same family and has pale flowers but it hardly fits the bill. The list of thistles goes on and really whichever was the original emblem doesn’t matter too much. There are possibly as many opinions on the flower that represents Scotland as there are thistles varieties. And a’ they hoped and wondered. Thistles grow thick and fast in this country and despite their designation as weeds they have traditionally proved useful as fodder for animals when chopped up although they are not grazed by them which is just as well or I might never have got to see those white ones in Mr Angus’ cattle park. Bees and insects love them for their nectar; Mr Angus has noticed that in mixed clumps of purple and white thistles bees are especially attracted to the white ones. Once flowering is past and seeds have set on those silky filaments green and gold finches move in to devour the tiny seeds. And we should not forget that the thistle has been used in herbal medicine, possibly for as long as plants and people have lived side-by-side. Pliny recommended thistles as a remedy for baldness and bad breath and as an effective carminative but he mentioned only purple ones so we may infer from this that whites were as rare as hen’s teeth in 1st century Rome as they are in 21st century Scotland. Culpeper in his Complete Herbal however does mention white thistles – but cotton ones which as we know do produce white heads more readily. Go into any pharmacy or health store and you will find milk thistle, silybum marianum, extract offered as an effective remedy for constipation and for strengthening the liver. Its use was banned by the Olympic committee – for athletes and not spectators I am assuming. Thistle is an ingredient in several contemporary medicines. It is said to be an antidote to Deathcap and Fly Agaric fungi poisoning. Thistle down was once used by the poor to stuff pillows which suggest there used to be many more thistles around in medieval Scotland than there are now. Time to consult the experts. 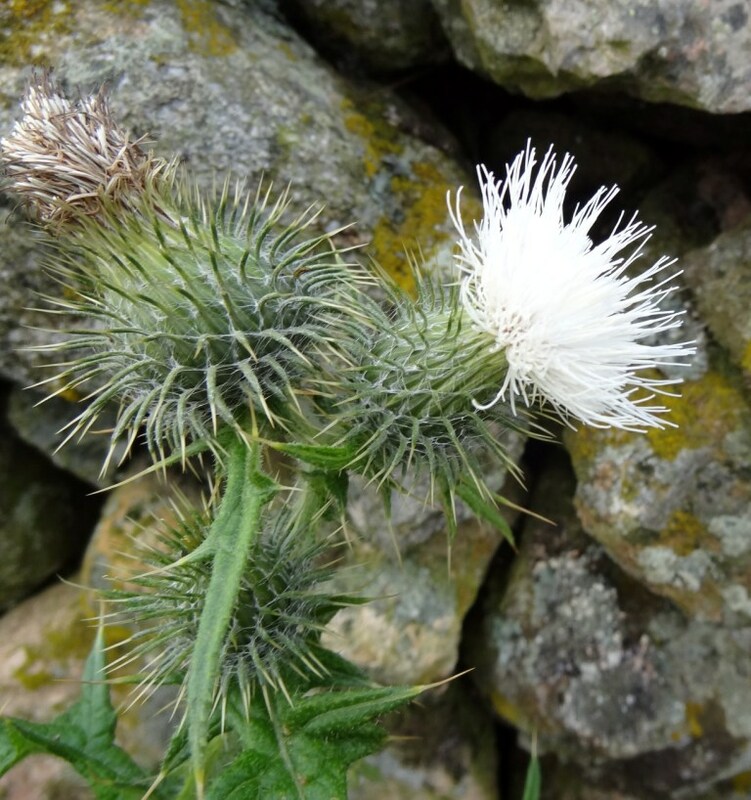 Dr Heather McHaffie of the Scottish Botanic Garden in Edinburgh has never come across a white spear thistle but compares incidences of whites to an albino ‘without the pink eyes!’ Such a shame. White spear thistles are rare and very attractive but just imagine them with pink eyes. They’d be queuing up at Mr Angus’ gate. 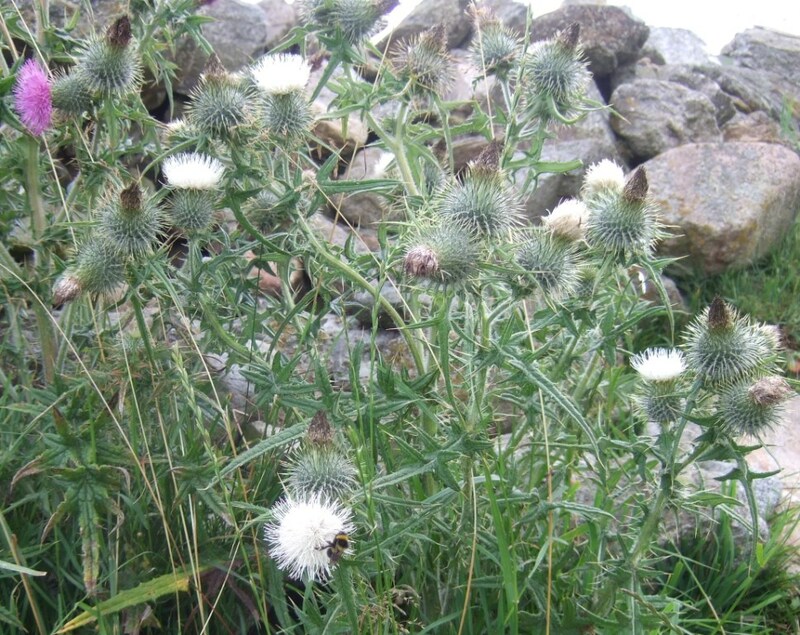 Professor Ian Alexander of Aberdeen University has seen whites in both Cirsium vulgare and the more common Cirsium arvense, the creeping thistle. This latter thistle, as its name suggests, spreads vegetatively by rhizomes and that is perhaps why white flowers are so much more common among them. 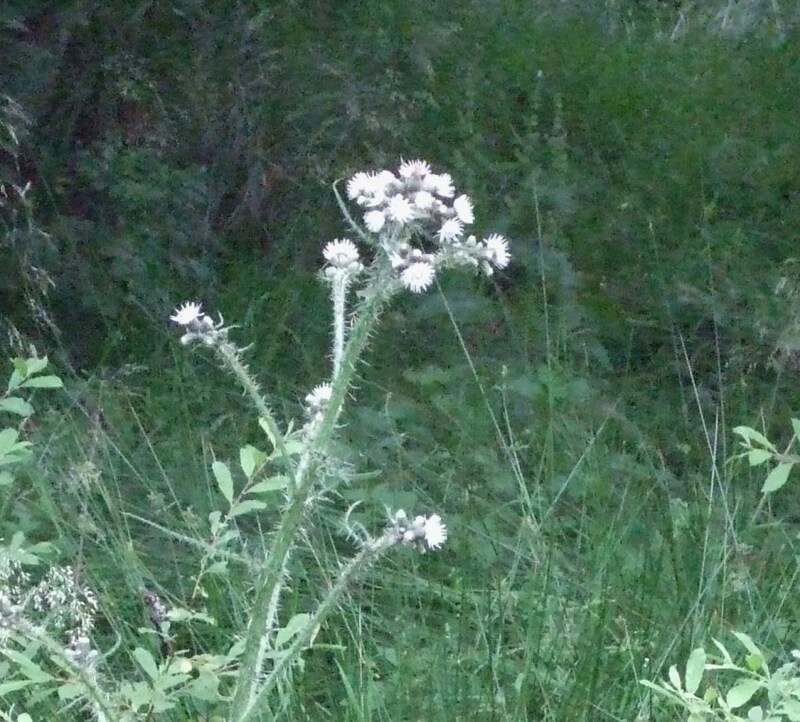 He explained that where a white plant sets seed – the result of cross-pollination from different flowers – then more white thistles could populate the area. This would fit in with Mr Angus’ experience of the thistles growing in the same spot, although not necessarily producing white flowers every year. Mr Angus suspected the white form originated from a garden variety stocked in a former near-by nursery but as Professor Alexander said, cross pollination will produce the white form from time to time – Dr McHaffie’s albinos minus pink eyes. While we might venerate the thistle on the one hand its incidence as a weed condemns it on the other. Saskatchewan in Canada is atypical in that there the plant is encouraged for its medicinal properties and value as animal food but the bonnie Cirsium vulgare is included in the Global Invasive Species Database making it a persecuted plant. However I would imagine that there are people who would love to provide a corner of their garden for that rare beauty the white spear thistle.